We had a great rotation to Camp I, acclimatized further by climbing up to the base of the serac wall at ~21,500′ and then descended back to base camp. We had a rest day yesterday and today, where we packed our gear for the upper mountain, practiced using our oxygen apparati and rested for the next push. We’ll depart tomorrow AM for our Camp II acclimatization rotation, where we’ll climb to Camp I tomorrow, climb to Camp II at ~23,500′ the following day but return to sleep at Camp I again, climb back to Camp II the next day to sleep up there and then retreat all the way back to base camp the following morning. This rotation will complete our acclimatization process. After that, we’ll await a good weather window to summit and depart for the upper mountain accordingly. Recently, we have been experiencing a lot of afternoon snow showers so ideally we’d like to see that pattern change a bit before our summit attempt. Thus far we’re feeling strong and looking forward to getting higher on the mountain and getting ready for a summit push around May 8th or so (weather depending). 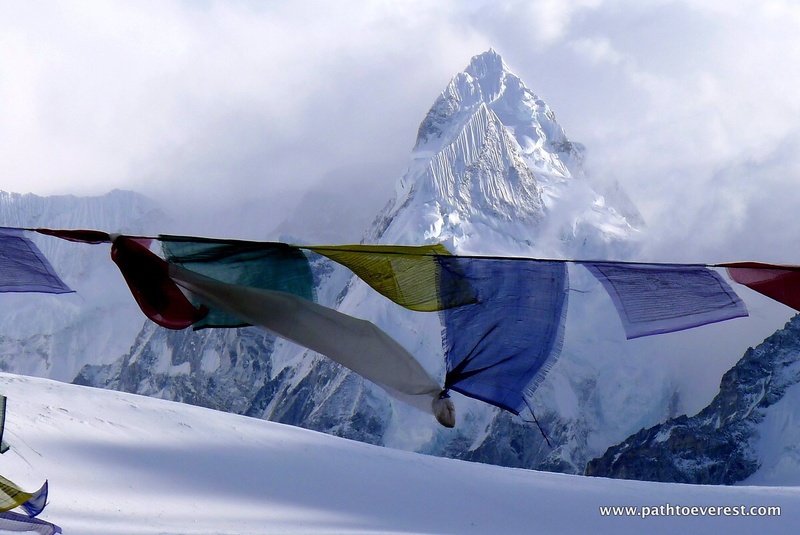 Here is one of the spectacular views we enjoy from Cho Oyu Advanced Base Camp. Amazing view and great to read everyone is feeling strong. Best wishes for continued success and safe climbing. Good luck and stay strong. Sharing your adventures with my son’s XC and Track team as an example of planning for success and adjusting as conditions dictate. Jim, Hello from Carl & Sandi @ SteelBridge. We hope you’ll get some great weather when you start your ascent. Best of luck! Thanks Carl & Sandi. Greatly appreciated.